Come be a rock star every Thursday! Sing or play with the house band, featuring members of Sugarleaf and Mr Schmiggity himself, Pat Waters. As always, everything is set up and ready to go. Drums, bass, acoustic guitar, electric guitar and vocal mics. Come on up on our awesome stage and play an instrument or sing a song. The fun starts at 9:30 pm. Let’s rock! Wednesday – Karaoke at 9 pm. Karaoke, costumes and fun! Come be a rock star. 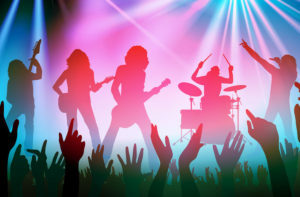 Thursday – Schmiggity Jam/Live Band Karaoke at 9:30 play or sing along with a live band. Bands every Friday and Saturday at 10 pm. Steamboat’s only Happy Hour from 7-9 pm with $3 Wells, Beers & House Wine. New to the bar menu: White Claw and 1/2 Bottles of Wines.